Ariocarpus kotschoubeyanus LRM303, adult and seedling plant. Ariocarpus kotschoubeyanus LRM303, hidden in the mud next to an Echinofossulocactus seedling. Ariocarpus kotschoubeyanus LRM303, habitat near Tanquecillos. 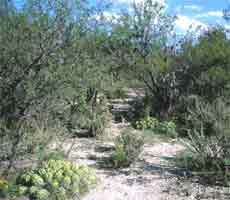 These plants are somewhat similar to the Huizache LRM280 in body size and flower color, which is not surprising given a very similar habitat and a ‘midlands’ location. 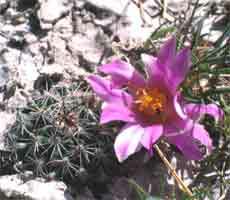 Accompanying plants include Ferocactus pilosus, Echinocereus sp. 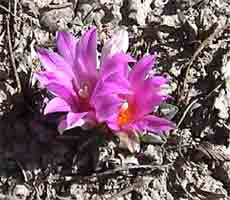 and Echinofossulocactus sp.